Christopher Columbus discovered the Dominican Republic during his maiden voyage in 1492. The Italian explorer, under the auspices of Spain, named it La Isla Española (“the Spanish Island”), later Latinized to Hispaniola, which today is shared with its French- and Creole-speaking neighbor on the west, Haiti. Today the D.R. has the largest economy in the Carribbean, mainly due to its burgeoning tourism industry, which attracts 5 million visitors per year. Whereas affluence tends to breed spiritual self-sufficiency, economic growth has coincided with openness, even eagerness, toward evangelical preaching among Dominicans. The Dominican capital of Santo Domingo, a colonial city founded in 1493, has emerged as a modern-day Geneva, a hub of Reformed churches and training centers for pastors and laypeople. This is a heartening shift in a context where Roman Catholic teaching and prosperity theology continue to dominate much of the religious landscape. Continuing our series on the gospel in Latin America, I corresponded with Miguel Núñez, senior pastor of the International Baptist Church in Santo Domingo and a Council member of The Gospel Coalition. In addition, Núñez has founded Wisdom and Integrity Ministries, and authored books like Una Iglesia Conforme al Corazón de Dios (A Church After God’s Own Heart). His ministry sponsors the annual Por Su Causa (“For His Cause”) conference. 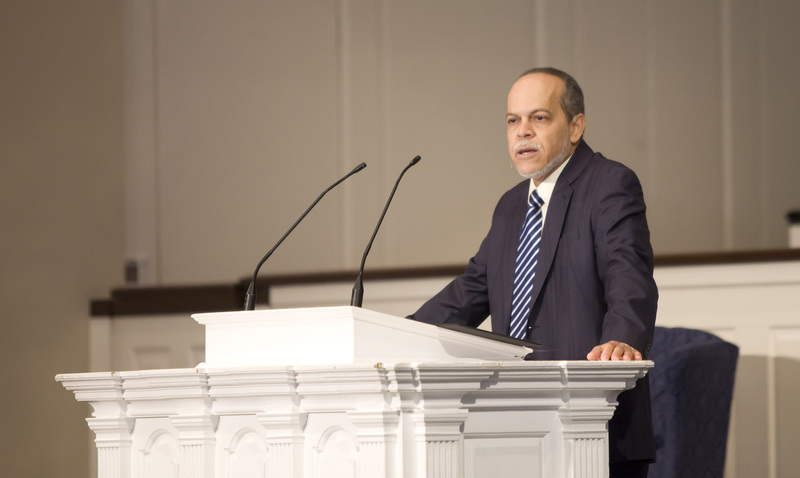 A recent CBMW longform profile of Núñez described his teaching as having “already played a significant, Luther-like role in the outbreak of Protestant teaching in this predominantly Catholic part of the world.” Luther-like or not, Núñez is part of a growing company of pastors with men like Sugel Michelén and Otto Sánchez, gifted and faithful gospel preachers. May their tribe increase and continue blessing the Latin American church! In this interview we learn about encouraging trends in the Dominican church, how the Lord is using the D.R. to stoke other nations toward the “doctrines of grace,” and what hopes we should have for the upcoming Spanish TGC preconference in Orlando, Florida. How would you describe the state of the church in the Dominican Republic? I believe God is visiting the church in our country in a special way. This manifests itself in numerical growth of the attendees in different churches. Most particularly, it is worth noting that Reformed churches have been “greening” both in membership and in the desire itself of learning from his Word. There is renewed hunger for the study of God’s revelation; therefore, shepherds and sheep that had been doctrinally weak churches have been seeking the support and help of churches more focused on the Word for them to “replant” their congregations. Finally, there is a new spirit of unity among churches that had previously been kept apart for a while. A recent report indicates that 8 in 10 Protestants in the Dominican Republic belong to a Pentecostal denomination or identify as Pentecostal. Is this something to rejoice over? Or is this a worrisome trend? I think the biggest concern in our Latin American region is the fact that there has not been a penetration of the “doctrines of grace.” Therefore, although the evangelical movement has grown significantly, especially in Pentecostal denominations, we have not yet seen a major impact in any of the Latin American societies as the result of the growth of the church. What distinguishes the evangelical church in Latin America from the evangelical church in the United States? What word of warning or encouragement would you offer believers in the states? The United States and Europe are in a postmodern era in their histories. According to many scholars they also are in a post-Christian time. By the grace of God, the Dominican Republic is not even close to a postmodern and post-Christian era. At present, the region is open to the gospel, and there is still a fairly widespread belief in the God of the Bible, although this does not represent conversion of most of the population. As an example, 40 years after the United States approved abortion, it is still not allowed in our nation because of Christian opposition. With regard to the difference between the Dominican Republic and the rest of Latin America, I could say that the “doctrines of grace” have spread more in our nation than in most other nations of the continent. In fact, many believe that God is using the Dominican Republic to stoke other nations. How can we pray for the church in the Dominican Republic? Watch this roundtable video where Miguel Núñez, along with Juan Sanchez and Carlos Contreras, discuss the need for a Bible-based, gospel-centered culture in Latino local churches.